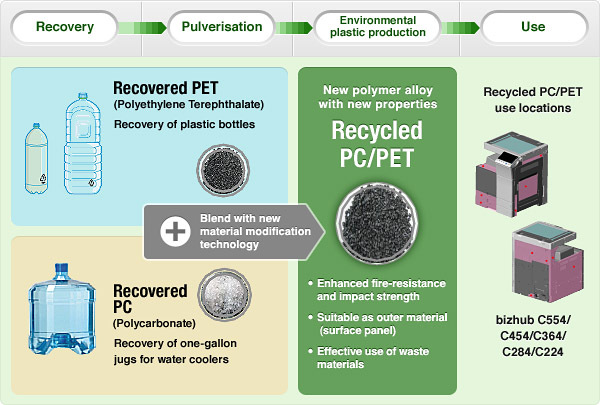 Konica Minolta has succeeded in developing recycled PC/PET through its own technologies using waste materials disposed by the public. Using waste materials also contributes to reduced waste for the society as a whole. A proximity sensor is built into the touch panel for faster recovery from Sleep mode when the user’s finger approaches the panel surface, making energy saving less stressful without affecting efficiency. The degree of eco contribution is graphically displayed to enlighten users to contribute to the environment. Eco Info (Eco Indicator) for toner and paper savings are displayed on the Eco Meter in 10 steps so users can confirm them according to the three perspectives of the entire device, department (account), and user. Furthermore, cumulative power usage can also be displayed. The weekly timer, which rationally saves power when the bizhub is not in use, now includes a learning function. It intricately cuts power consumption by learning and adjusting the settings to real-time use. 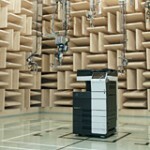 Konica Minolta has been working hard to create quieter MFPs. Since 2007, the company has been involved in joint research with Kyushu University aimed not only at reducing absolute noise level, but also cutting uncomfortable noise to make the MFPs sound more pleasant. Please listen to the difference in the operating noise.Please be aware of the sounds. Although most MFPs utilise heat for fixing the toner onto the paper, the bizhub C754/C654/C554 adopt an IH fixing system that offers better heating efficiency than conventional systems. Combined with the 10-degree lower fixing temperature provided by Simitri HD toner reduces power consumption by approximately 15%* over conventional models. The small size and consistent shape of Simitri HD toner particles ensure sharp reproduction of text as well as line drawings. Its smooth outer surface provides excellent hold and promises high image quality across a diverse media mix. 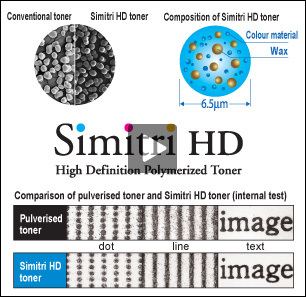 Furthermore, bizhub uses low-temperature fixing to affix the Simitri HD toner. Using less heat saves energy and effectively reduces paper stress. When it comes to forest resource conservation, paper use reduction in offices is important; double-sided printing is an effective means of achieving such reduction. The bizhub C650/C550/C451 realise high-speed printing when outputting double-sided colour pages, thanks to a paper feed control system that feeds three sheets alternately. This system offers productivity equal to single-sided printing, and makes it easier to reduce paper use in offices. Konica Minolta’s original Toner Loop Mechanism, which collects, circulates and reuses any toner that has not been transferred to the paper, is utilised for almost all of our black & white MFPs and laser printers. This process realises resource conservation by reducing the normally 5 to 10% of wasted toner to zero.